Now your child can brush along with one of their favourite characters! 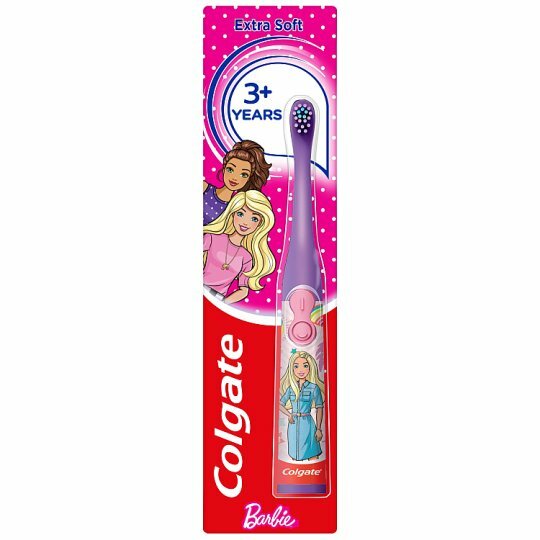 The Colgate® Barbie Kids Battery Powered Toothbrush has a small oscillating head and extra soft bristles to clean teeth and gently sweep away plaque. And it's simple to use - the slim handle is easy to hold, the brush lays flat for easy toothpaste application, and the large buttons mean it's child's play to turn on and off. Clean your teeth better than with an ordinary manual brush and make brushing fun! Enjoy all the different designs! Brush head is not replaceable. Dentists recommend replacing your toothbrush every 3 months. Do not mix old and new batteries. Do not mix alkaline, standard (carbon zinc) or rechargeable (nickel-cadmium) batteries. Not intended for children under 3.